The time for climate action is now! On Saturday, March 1, the SoCal Climate Action Coalition 350 and its regional partners rallied in the shadow of a Port of Los Angeles oil refinery, sending marchers on a 17.5-mile trek through the streets until they reached downtown Los Angeles. Read about it here. Hundreds of marchers then continued their journey for 3,000 miles towards Washington D.C., reaching out to everyday citizens along the way on how they can fight climate change in their daily lives. 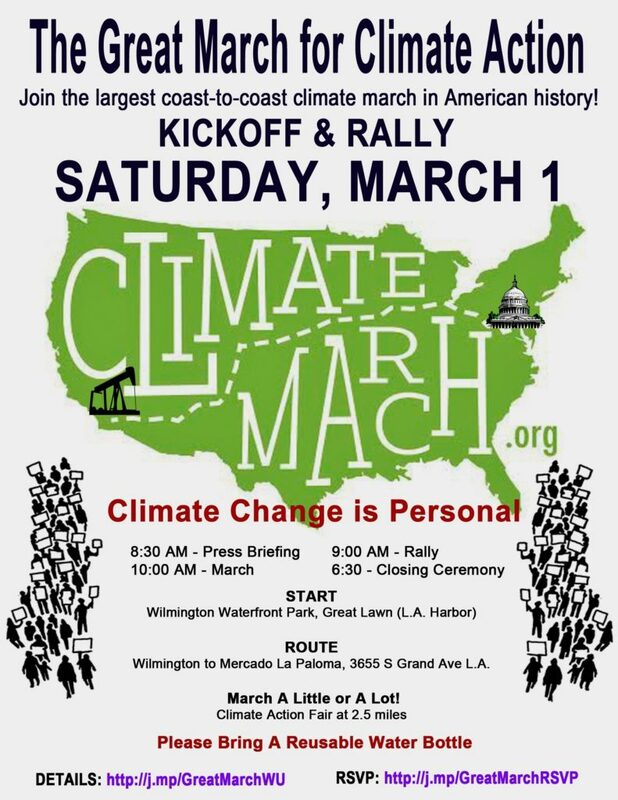 Join together for the largest coast-to-coast climate march in American history! On Saturday, March 1, at 9:00 a.m. (8:30 a.m. press conference), join the SoCal Climate Action Coalition 350 and its regional partners to help kick off the Great March for Climate Action. Thousands are projected to join the mobilized mass movement starting in the Port of Los Angeles, with hundreds continuing to march 3,000 miles to Washington D.C. to deliver the message that we need immediate legislative and executive action to solve the climate crisis. What is the Great March for Climate Action: The goal of the Great March for Climate Action (ClimateMarch.org) is to change the heart and mind of America and its elected leaders to act NOW to address the climate crisis. This will be the largest coast-to-coast climate march in American history. Why Participate in the Kickoff? The symptoms of climate change are clear and abundantly real. Climate scientists’ dire predictions are coming true faster than forecasted. We are suffering the effects of global climate disruptions including fires, droughts, storms, rising seas, species extinctions and loss of human life. NOW is the time for all of us to step up and let our collective voices be heard. We must ask our elected officials for real solutions that transition us away from exploration, production, transportation, and consumption of climate-damaging fuels that pollute our land, water, ocean, and air. March A Little Or A Lot – Feel free to march only a little, meet us along the route, or join us for the closing ceremony. The full route is 17.5 miles and ends near L.A. Expo Park/USC area (Mercado La Paloma, 3655 S Grand Ave Los Angeles, CA 90007). Click to enlarge. You get to Wilmington Waterfront Park by taking the “C” Street Exit in Wilmington off of the I-110 Freeway South and heading east, the take a right on Figueroa, left on Harry Bridges, left on King to get back on C Street, fronting the park. Parking is on a lot C Street (Item 15) with overflow at 31 – next to the artificial turf area. As well, lots of free street parking is available. We Stand in Solidarity: The organizers of the Great March for Climate Action, in recognition of the serious air quality and pollution issues facing some of the most vulnerable members of our California communities, agreed to start their 3,000-mile march at the Port of Los Angeles. Citizens of Southern California will have the unique honor to host the kick-off rally and be part of history. Thanks to David Hendricks for the Great March flyer and SoCal 350 Logo! Blessing to all who do this march & thanks for doing it!